Though more glaring and fraught examples are to be found among the ruling, grifting crime syndicate (here and here especially) of the US, we appreciated the spirit in which the origins of both Cobra and its foil the elite paramilitary unit, G*I* Joe, was shared. 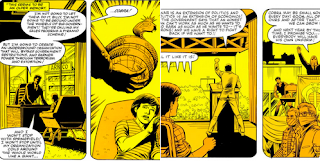 Loosely based on conservative pundit William F Buckley (*1925 – †2008), Cobra Commander of the Marvel canon was a used car salesman in Springfield, Anytown America whose brother served on multiple deployments to Vietnam in order to spare his brother from being drafted. Suffering from post-traumatic stress, Cobra Commander’s brother took towards increasing self-destructive behaviour—ultimately leading to his demise in a car collision. Inconsolable, Cobra Commander blamed the crash on the survivor, another veteran who afterwards sequestered himself from the world and studied the martial arts in Japan. 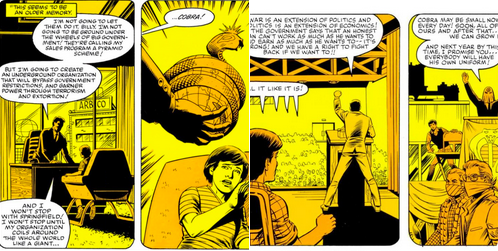 Hungry for vengeance, Cobra Commander contracted the services of an assassin, who mistakenly killed the ninja master rather than the student—persuading the survivor to reenlist later as Snake Eyes. After this debacle, Cobra Commander sought to return to his dealership but his wife discovered what had transpired in Japan and threatened to come forward to the authorities. Cobra Commander abandons his wife and takes their infant son on the road to eke out a living, conning the unsuspecting and setting up a pyramid scheme to attract followers and accrue funds, appealing to the disenfranchised for whom he finds a resonant kinship. Cobra Commander begins wearing a blue hood during his motivational talks to disguise his identity.